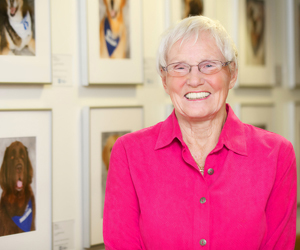 Thirty-two years ago a committee of volunteers, including Marilyn McGuckin, and the Quaker Square Hilton had a fundraising goal in mind, surrounding the holidays. The committee got together and wrote a letter asking community leadership for donations of trees and other holiday items. This was the birth of the inaugural Holiday Tree Festival. 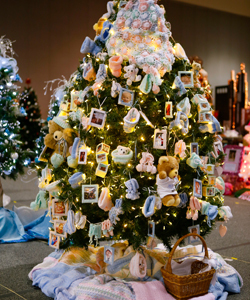 The first tree festival featured one miniature tree and 15 regular-sized trees. The festival was at the Quaker Square Hilton the first year and raised more than $26,000 for the hospital. The committee also got a few people with trucks to help deliver holiday joy. Throughout the years, the committee and the festival have grown. The festival moved to its current location at the John S. Knight Center and now has more than 1,400 committee members. There are also more than 150 trees, and countless other wreaths and holiday gifts. One thing that hasn’t changed, and never will, is that admission to the festival is free. The concept of the festival is same as when it started 32 years ago. Money is still going to the hospital and helping the children in the community, and now it’s family tradition for many. To see the trees, wreaths and other holiday creations, visit the Holiday Tree Festival, Nov. 23- Dec. 1, at the John S. Knight Center. Admission to the festival is free. For more information, click here.